Click here for 12 full quotes from Barack Obama in the book Hopes and Dreams, by Steve Dougherty. This is a nice coffee-table book about Obama -- very appropriate for Obama fans who want to have something for house guests to look through. It is richly illustrated, and in a large format, so the pictures are splendid. It's light on text, which is why we have so few excerpts, and the text mostly deals with Obama's personal life. Not a book for policy wonks! But there are other books about Obama for that purpose. And also not a book for Obama opponents who want to find some dirt -- it's way too supportive for that. And finally, not a book for supporters to discuss deep details of Obama's positions -- it's just for an introduction. P.S. I wrote in the review of The Audacity of Hope a subtle basis for the title of that book. The author explains here how it comes from a sermon Obama once heard. So much for over-analysis. Smokes cigarettes now; smoked some pot in high school. Protested South African apartheid while at college. Replace partisan bickering with politics of hope. Assigned RFK�s Senate desk; invokes RFK regularly. Lost Congressional primary in 1999 to Bobby Rush. Personal story is basis of political desire to unite. Greeted as hero on visit to ancestral Kenya. Traces ancestry to Jefferson Davis, President of Confederacy. Father died in car crash before Barack got to know him. Source of his book title �Audacity of Hope� was a sermon. Iraq 2002: ill-conceived venture; 2007: waste of resources. Community organizer on Chicago�s South Side. 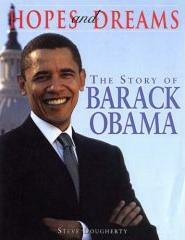 The Story of Barack Obama, by Steve Dougherty.